I own a lot of wired and bluetooth headphones, AKG701, Grado RS1, RS2, Jabra Move, Jabra Stealth, Anker Soundbuds, Klipsch X11i, Bose QC20i, Bose soundsport wired, and more. 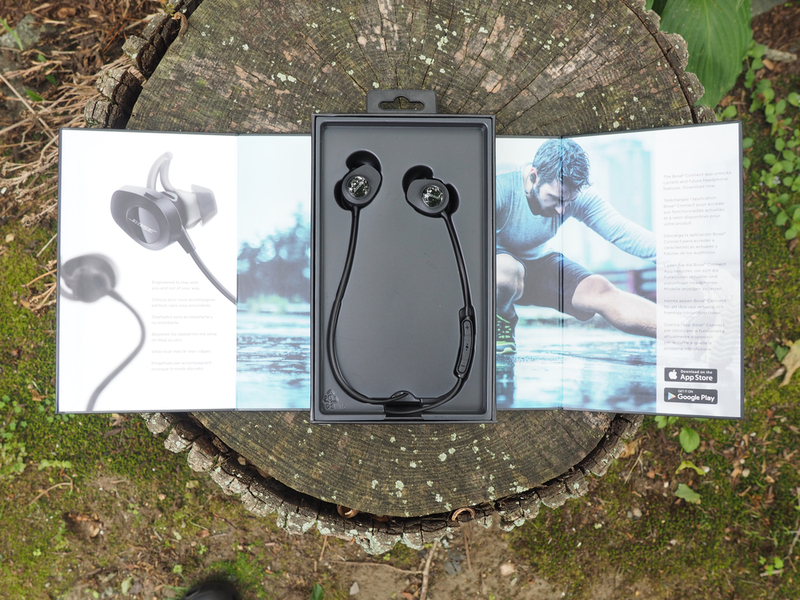 If you are looking for the best wireless (bluetooth) headphones to date? Get the Bose. These are the best wireless (bluetooth) headphones to date for both sports and indoor use. Since Bose products seldom sell below MSRP, you might as well pick up a pair from Amazon now if you want to try them out. The Bose ear tip, they called it the StarHear+, does not insert completely into the ear canal. That means there is less pressure on your ear, and you can wear it longer. The tip shape is oval, like the klipsch. The wireless version’s ear tip has a outer layer that seals better than the wired version (see photo). This is the design they have on the QC20 noise canceling earbuds. The ear tip also has a soft wing that you tug into the ridge of the ear to help keep the earbuds stay in place. All of that means the ear buds is going to stay put comfortably. On a 5K run, I did not have to adjust the earbuds once. Compare to the Anker for example, I would get loose all the time. The only downside is that if you like sound isolation, you are not going to get that with this design. I like to not completely tuned out my surroundings when I run outside, or in the office. So I actually prefer this design. For immersive music listening I would use my Klipsch x11i or other full size headphones. Wireless headphones are as good as their bluetooth implementation. The connection for this Bose earbuds are very good. In a semi open house layout, I can walk the entire first floor without and connection drop out. Similarly in an office environment I can walk at least 30 feet away without dropped connections. 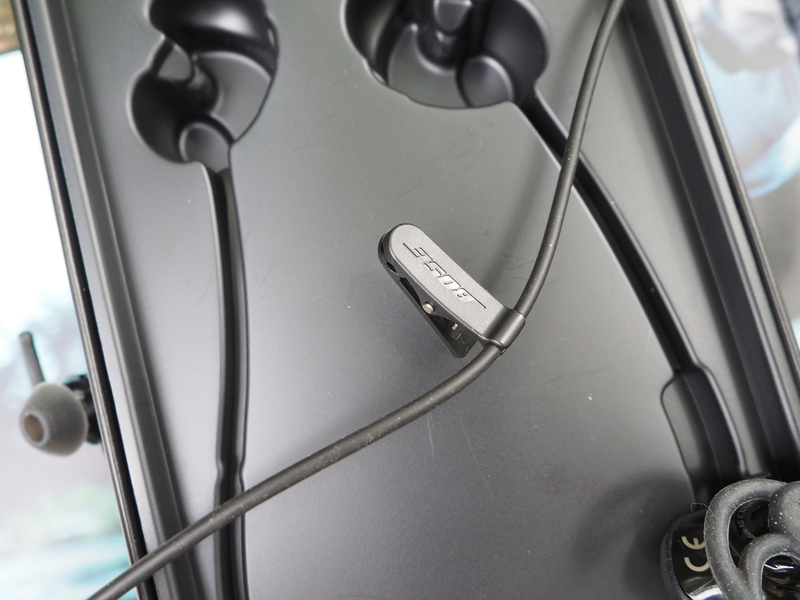 The Bose bluetooth implementation have a nice feature that I have not hear before — the headphone will announce the names of the one, or two devices that it is connected to. Assuming it gets the device names from the devices themselves, when I switch on my Bose, I hear: "battery at 100%. Connected to <PK iPhone 5S> and <My Laptop Hostname>"
The bluetooth is multipoint, which means it will stay connected to, and switch between two devices. 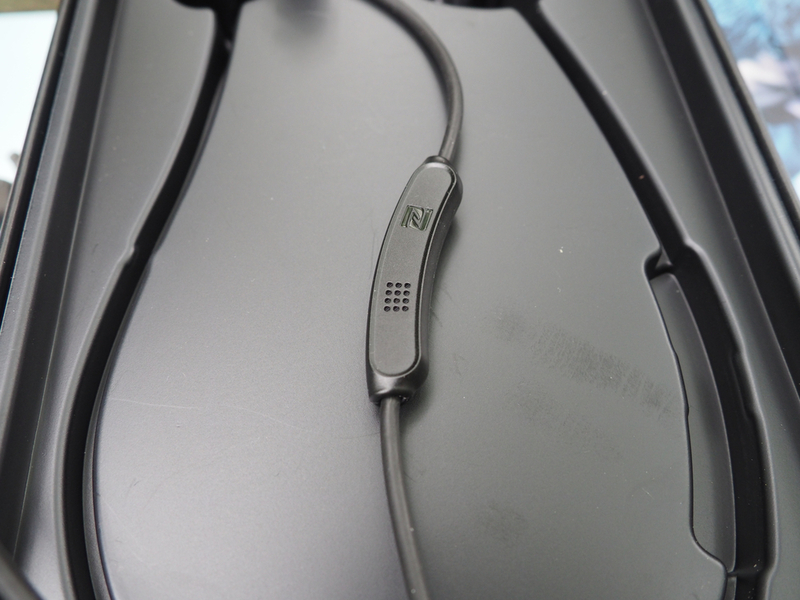 You can have more connections registered with the headphone, and it will seek out the most recent two devices on the list. this is the Bose new feature — Bose has an app for the iPhone. I can use the app to tell the headphones to connect to any of the devices in it’s list. The Bose build quality is top notch. The cable is not fashionably flat, but it is thick enough that I feel it is going to last. It has a soft matt rubbery finished that feels great. The in line control on the right side has a curved body. At first I find it strange, but I after using it a bit I think it helps bend the wire back towards the back of the neck when you wear the headphone. The buttons on the inline control are all under a soft rubber cover. They takes a bit of force to activate. The + and the - buttons are higher than the middle, so pressing them by feel is easy. There is a single clothes clip at the middle of the cable. It works well - if you clip it onto the back of your shirt collar, it will hold the earbuds on your neck if you removed them from your ear and just have them dangling in front. The only questionable design I find is the circular “button” with Bose brand name on it on the earbud. I find that visually it makes the earbud looks big. 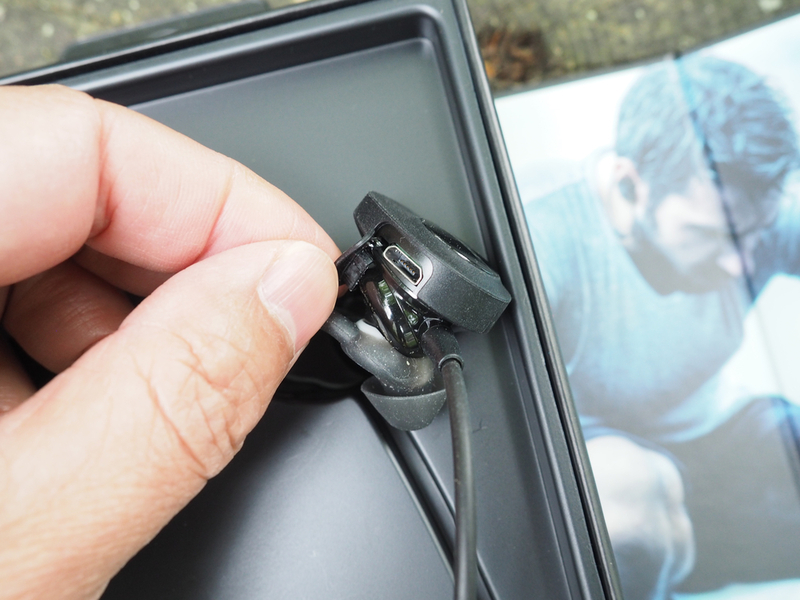 The earbuds come with a zipped circular carrying case. It looks just like the one that comes with the wired sound sport. The quality is ok, very slightly better than the no name Chinese cases that you can find on eBay or amazon. They are expensive, but if you want to spend the money, this is the best bluetooth headphones on the market right now. 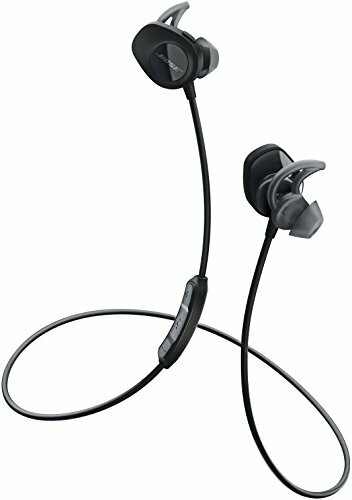 I honestly do not see why anyone would get a jaybird X3 or freedom when this is available. If you really want to go affordable, get the Anker Soundbuds when they go on sale, sometimes for $20. Otherwise, get the Bose!